Today's giveaway is for a Thesaurus in yellow Fat Quarter Bundle sponsored by The Intrepid Thread!! Don't you just love those happy bright colors!! 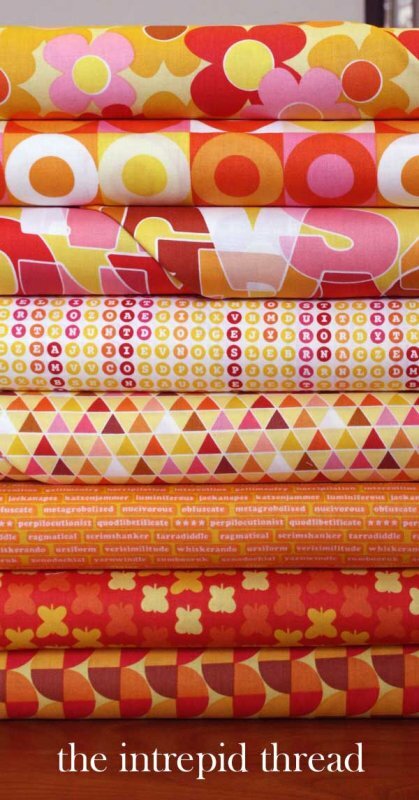 Leave a comment here of your favorite Fat Quarter Bundle at The Intrepid Thread. I like the Thesaurus FQ collection at the IT. Your Summer Breeze pattern is one of my favourites. Happy bog anniversary. Oh this FG would certainly fit the bill right now - love those yellows and textures. Thats a darling quilt too :) Thanks for the nice giveaway today. I like Wish and Reminisce. Summer breeze is a very nice quilt, nice pattern and colors. I like the Thesaurus FQ bundle a lot but I think my favorite is the Remix Ovals. I would take any and all bundles of Madhuri. I adore that line of fabric. I love the Thesaurus bundle in yellow! Not colors I would normally pick but beautiful! I really like Remix Ovals....but it is out of stock, so I will pick Kona Modern Quilts - Fat Quarter Bundle in Berry - that is a sweet bundle too! Subscribed to the Intrepid Thread page! I couldn't resist all that fabric loveliness so signed up for the newsletter too. I signed up for the Intrepid Thread newsletter. I really like the looks of Cleo and all those In From The Cold bundles. Happy Anniversary! Loving these Celebration Days!!! I am also loving the Wish Fat Quarter Bundle Complete Collection... who couldn't have more courage, patience, and strength?! Thanks!! I am already signed up for the Intrepid Thread newsletter - thanks for an extra chance!!! Soooo many choices, but Tsuru is totally my favorite right now! I'm starting to think Christmas so I would have to choose A Merry Little Christmas! Definetly In From The Cold Marshmallow. I have my eye on this FQ bundle or even the half yard bundle. I do subscribe to Intrepid Thread. Winter's Lane for me ! I like the Aspen Frost bundle! Love the Tangier Ikat bundles. Such warm colors. My favorite is the 2wenty Thr3e FQ bundle. And happy blogiversary. Thanks. My new favorite is Reminisce by Art Gallery. I purchased one fat quarter bundle from The Intrepid Thread. Also took advantage of their 20% off sale yesterday. I like the Thesaurus FQ bundle in pink. My kids are all boys, but I love pink! I am already receiving email newsletters and enjoy them very much. I love the Aspen Frost FQ Bundle. I really like the remix ovals, but almost too many to choose from! The Aspen Frost bundle is the one bundle I would like to have. I have always liked your Summer Breeze Quilt. Thank you for the awesome blogiversary this week and giving all of us, your followers, a chance to win. I know I would love to receive a squishy package in the mailbox. Aspen Frost Fat Quarter Bundle is my current fav. I subscribed to Intrepid newsletter. I love the "I Am Ninja" FQB -- my granddaughter is really "into" Karate right now! I am currently allready subscribed to their newsletter. Thank you for the additonal chance to enter your day 5 giveaway. I like the Bijoux bundles! Congrats on your Blogaversary. Remix Ovals is my favorite. I love your Summer Breeze pattern--it would look gorgeous in that Thesaurus FQ bundle you're giving away, wouldn't it? One of my favorite FQ's at The Intrepid Thread is the Folk Tale bundle in Melon & Grey--so soft & cuddly! This has been a fun week, Melissa; I've enjoyed it very much. I like the Thesaurus in yellow you showed. I need that in my collection. Taurus is a nice bundle but Thesaurus is great. It is hard to choose but I think a Tangier bundle would be so fun to make something with. I'm enjoying your blog's anniversary! I' wouldn't mind having anything form thepretty Field Day collection. I am already a subscriber to the Intrepid Thread newsletter. I love the colors of Wish. I already get Intrepid Threads newsletter. I am Ninja is awesome. Thanks for the chance to win! I love the Bijoux bundle! Thanks for the giveaway and Happy Blogaversary! I'm already a subscriber. I love the Intrepid Thread! Remix ovals, look at all those bright happy colors! I subscribe to the Intrepid Thread! I love Thesaurus Fat Quarter Bundle Complete Collection! Love your Summer Breeze quilt! Reminisce FQB Plus is a favorite! Thanks for the chance! I love the shelbourne falls bundle. Oh, so many favorites. I think Bonjour Mon Ami would be lovely. And I just signed up to receive Intrepid Threads. I like the Thesaurus Fat Quarter Bundle, Complete Collection. Thanks for the chance Melissa! I love the folk tale bundle in coral and grey. My fave bundle is the Bonjour Mon Ami Fat Quarter Bundle Complete Collection. Thanks! I subscribe to Julie's newsletter. Thanks! I like the Indie Chic fat quarter bundle in blue. I really like Bijoux. I love your quilt pattern. It is really fun. I am already on the Intrepid Thread's newsletter list. I love so many of the bundles, but I will choose World Tour Fat Quarter Bundle Complete Collection. Thanks for the chance to win and Congrats again!! I am a newsletter subscriber also. I love Bijoux! Happy blogiversary - I love that pattern! Tangier Ikat fat quarter bundle is my favorite!! It's hard to pick a favorite, but would have to go with the Tangier Ikat's. Thanks for the giveway...the Thesauras bundle is bright, beautiful and graphic! I love the Shelbourne Falls but the new Winter lane is amazing! I love the Thesaurus Fat Quarter Bundle Complete Collection; what perfect colors!! I'm a longtime subscriber to the Intrepid Thread! I suscribed to Intrepid Thread's newletter. I have to say that I love how they display the fabric in the bundles that that you can get a good representation of them. Much better than the small squares that your usually find. I will definitely return to this site many times. I have two favorites, but they both appear to be out of stock - Winter's Lane and Indian Summer! I receive Julie's newsletter from Intrepid Thread. My favorite bundle is squared elements. I also subscribe to Intrepid Thread. I love the In From the Cold bundles. So cute. And the quilt is just so beautiful. I really like Bijoux, the prints are gorgeous. Happy Blogiversary. I like the Tangier Ikat collection. The colors are wonderful. Folk tale bundle in melon and gray. Looks very interesting. My favorite bundle is Tsuru. Tsuru is still my favorite - but I do like Global Bazaar a lot too! I follow Intrepid Thread & subscribe to the newsletter! So many fabrics... Sew little time! I love the Thesaurus line. Just beautiful! I love Indie Chic in blue. Happy Blogiversary! The Thesaurus bundle, love all the bright colors and different patterns. the 23 bundles are fab! My favorite is Field Day - Half Yard Bundle Complete Collection, gotta dream big! Happy Blogiversary!!! I do love your pattern - I had not seen it because I suppose I started following along after that. Very fresh and happy :*) As for the FQ bundle - just give me the Thesaurus in yellows!!! I can't find anything I like better - they are AMAZING!!!! I'm really liking Winter's Lane right now. I received the newsletter from IT already. My FAV would have to be Indie Chic in blue.....gorgeous. I really like 2wenty Thr3e. I love the Shelburne Falls bundles! I would love to get the In From the Cold Half Yard Bundle in Marshmallow, and get a jump on some Christmas quilting. I like Roughing It, nice Collors! I love the bundle you are giving away, but I also really love Madhuri!!!! The one I love best is the Tangier Ikat Bundle in warm! They have some great combinations! I like the In From The Cold bundle. Thanks for the giveaway. I am already subscribed to the Intrepid Thread's newsletter. HELLO,REALLY LIKE 'SUMMER BREEZE' TOO! LOVE THE KONA FQ BUNDLE IN BERRY. I am loving all of the Christmas collections that are coming out - my current favorite is In From the Cold in Marshmallow. Thanks for the chance to win! The Cleo bundle would be my pick. Love your Summer Breeze Quilt! The Reminisce - Fat Quarter Bundle in Sweet Reveries is super cute. I love the one you are giving away, too! Congrats on your blogiversary! I am new to the quilting world and glad I found your blog! I love the mustard + pavement bundle of 2wenty Thr3e. I am already a subscriber to Julie's Intrepid Thread. Thanks to both of you for the give-away and Happy Blogiversary to you! I love the colors in the World Tour bundle. i do love anything new so today i like Thesaurus, great colors. Thanks so much for the chance to win this gorgeous bundle! There are so many I would choose! I really like the Madhuri - Fat Quarter Bundle Complete Collection, I just love the elephants. Happy Blogiversary too! I signed up for the newsletter also! Thanks! I really love the I am Ninja bundle although I have NO idea what I would ever do with it! The ninjas are pretty cute! It's so hard to pick. I'll go with Tangier Ikat. I adore the I Am Ninja bundle! I subscribe to the Intrepid Thread newsletter. 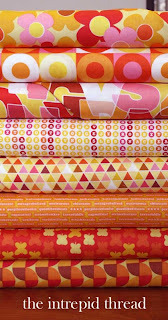 My favorite is the Bijoux Fat Quarter Bundle in Ruby Spirit. I am liking In From the Cold. Thanks for the giveaway. I already subscribe to the Intrepid Thread newsletter. I love all of Julies fabric! I am lucky that the brick and mortar is so close to me! I really like Bijoux. Thanks. I subscribed to The Intrepid Thread Newsletter. I love the Indian Summer bundle. I already receive Julie's newsletter. Lots and lots of great bundles! I really love Bonjour Mon Ami in Warm. My favorite is the Bonjour Mon Ami complete FQB. Happy blogiversary and thanks for sharing all of the goodies!! I already get Julie's emails. Thanks to both of you, and happy blogiversary!! I could go for the blue Indie Chic bundle! Paloma is definitely my favorite Fat Quarter bundle!! Hi! I like the Reminisce fq bundle complete! It is so pretty!! Thank you for the chance to win! I liked the Reminisce FQ Bundle in Sweet Reverie Plus. Getting matching solids or small prints to go with collection. Neat!! I signed up for the Intrepid Thread newsletter! Hi! I signed up for the Intrepid Thread's newsletter!! Thank you for the chance to win! I really like Thesaurus right now. Thanks for the giveaway. I like the remix ovals bundle. So pretty and bright. I love the Bonjour Mon Ami bundles, so cute!! I love Indie Chic in blue with Holiday Bouquet in green a close second. Tangier Ikat is my favorite. Thanks for the chance to win.